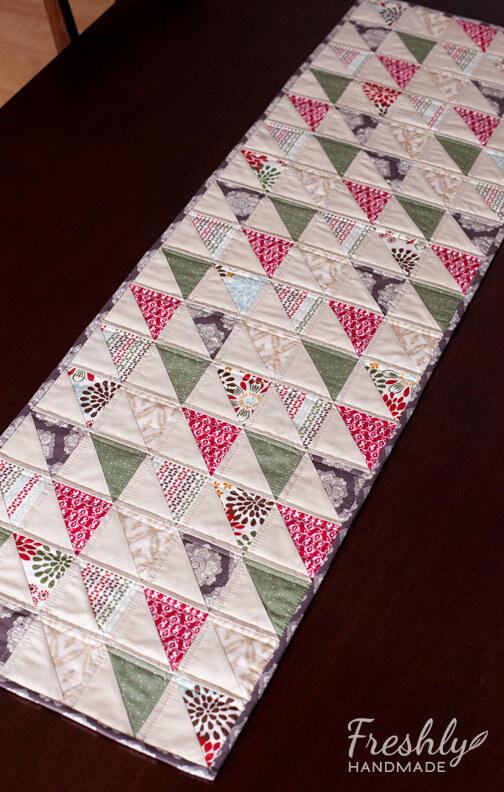 I finished the half square triangle table runner for my sister-in-law. It measures 15" x 51" and is made of up six different prints and a neutral solid cotton. When I was cutting the squares to make up the 3" half square triangles, I forgot that each square makes two half square triangles, so now I have enough blocks to make two table runners. I quilted it using straight stitch 1/4" on both sides of the horizontal and vertical seam lines. I tried something new by machine sewing the binding. I typical machine sew the top side and hand sew the back side, but I've always wanted to try machine sewing it since it is faster. 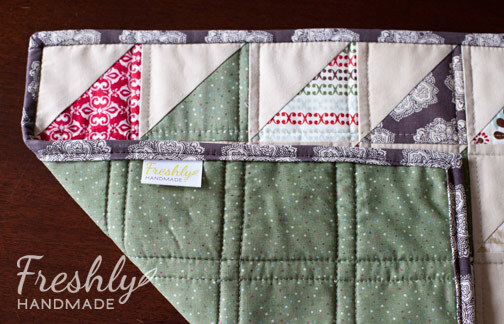 This was a great project to try it out since not many people pay attention to the back side of a table runner. 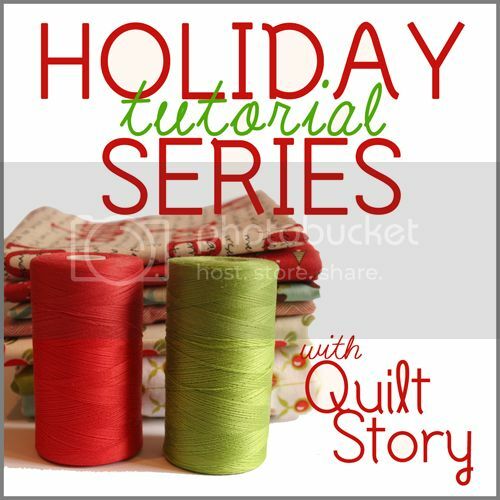 I referred to this great tutorial from Red Pepper Quilts. I used 2-3/8" binding strips because this was my first time doing it this way and I wanted to make sure I caught the back side. I think on my second table runner, I will use 2-1/4" strips to get the stitches closer to the edge. 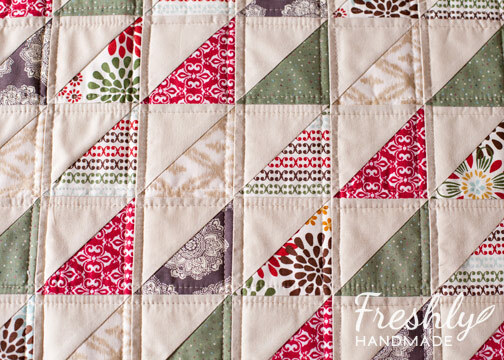 I'm not 100% sold on this method just yet for my quilts because I like the concealed and clean look of hand stitiching. Perhaps I will feel different as I practice more, but I am glad I tried it. I've linked up to Amanda Jean for Finish It Up Friday. Beautiful! Love the colors and your binding turned out nice. looks like you have not washed it yet? I do find that I am happier with the machine binding after washing it, the varriances look less noticable then. 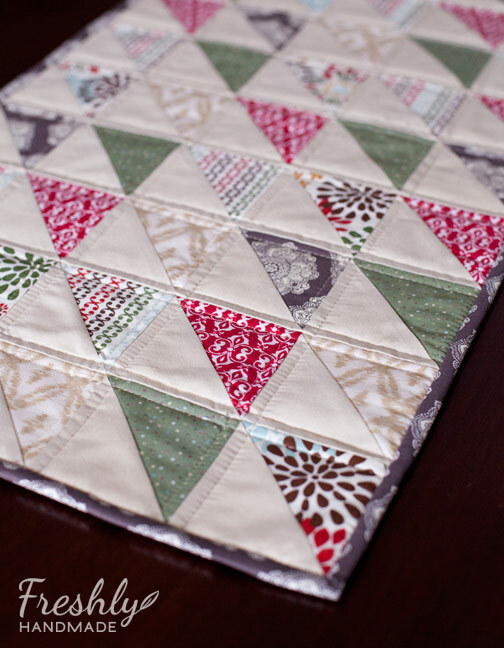 I really love the way you quilted this. I want to do this on a project. The colors are great, too. Your binding looks fine for this, but I know what you mean. I use a blind stitch for mine. I'll probably do a tutorial on my blog in a few weeks if you want to see. It's lovely, Stacy! I love that you have enough to make 2 runners. :) machine binding DOES get easier....and even if you don't use it for binding everything you make, it's a nice trick to pull out of your back pocket when needed. Very nice, Stacy! I machine bind everything. One of these days I ought to try hand binding, I guess. 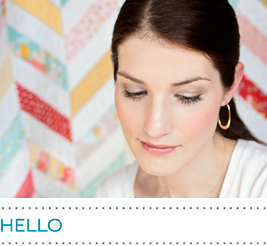 Love your color selection and the way your quilted it.